Featuring Emma Stone, Kristen Stewart and more. Sometimes what&apos;s going on with the spectators at Fashion Week is at least as interesting as what&apos;s barrelling down the runways themselves. While we&apos;re waiting on what "Prophet Pete" (as Canadian Living beauty ed Katherine calls Chanel creative director Peter Philips) has to say about those French manicures on the Chanel runway—I know many of you were shocked and horrified—let&apos;s instead cast our gaze on the celebrity attendees. Not just at Chanel but also Dior, Miu Miu, Balenciaga. It&apos;s a tough gig for a celeb, attending Fashion Week—because impressing fashion people is way, way different from what you do on a red carpet. Here are five celebs who did it right... maybe you&apos;ll be inspired to play copycat with one of these looks? Leelee isn&apos;t what I&apos;d call conventionally pretty, but she&apos;s so, so striking. It&apos;s her angular face and those piercing blue eyes. I love her brows, and I love that she didn&apos;t match her lip colour (pink) to her dress (red). It&apos;s that whole contrast thing that makes it interesting. The only quibble I have is with the blush or bronzer or whatever it is sitting low under her cheekbones. It could just be the lighting, but from this angle it would&apos;ve been MUCH better without it. Fun fact: did you know that Amanda is one of the few (VERY few) celebs in Hollywood whose hair colour is 100 percent natural? It&apos;s true. Harry Josh told me so, and he would obviously know. But it&apos;s not her hair I want to talk about here—it&apos;s those glossy purple lips! Such a departure for her, jumping on this fall&apos;s vampy lip trend. It&apos;s risky, but somehow it looks totally modern and totally right. Note that like LeeLee, she&apos;s avoided doing the obvious matchy-matchy red. 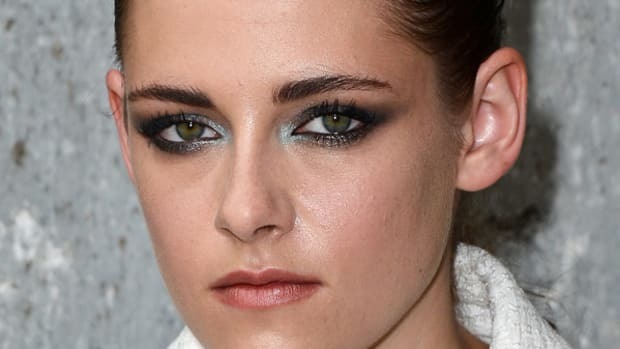 I don&apos;t know what&apos;s happening, but suddenly I am starting to like K-Stew. She&apos;s totally grown on me, and lately she&apos;s been looking better than ever. At Balenciaga she was all biker chick with this lemon yellow jacket and tousled hair to match. I really think the auburn shade is her best colour, and the way she&apos;s wearing it pushed over to the side is extremely flattering. Is it all down to Nicolas Ghesquière&apos;s influence? How is Jennifer Lopez 43 years old?! She doesn&apos;t even look like she&apos;s mucked up her face with injections, so it has to be genetics. It&apos;s almost like she&apos;s showing off that she still looks like she&apos;s in her 20s with this (hard-to-pull-off) ballet-inspired look at Chanel. The updo has that fuzzy halo thing I&apos;ve told you about to soften it, and her eyes are enhanced with a very slight wing of liner at the outer corners. Then, just pretty pink on the lips. Simple, timeless, gorgeous. It&apos;s my girl Emma! Rocking a red lip like nobody&apos;s business. According to Glamour the lipstick is Chanel Rouge Allure in Exaltee... so now we all need to run out and buy that. Also: did you realize Emma had so many freckles? I didn&apos;t, but I&apos;m happy that the makeup artist didn&apos;t cover them up (even though I have a problem with my own!). I&apos;m also warming to her blonde hair colour, which looks incredible with these mid-length waves. Oh Emma, you never let me down. Which one of these celebrity Fashion Week looks is your favourite? Are you a fan of Emma&apos;s red lips... or Amanda&apos;s purple ones? What do you think is J.Lo&apos;s secret to looking so amazing?! If you ever score an invite to Fashion Week in Paris (hey—it could happen! ), do your hair and makeup like these celebs. 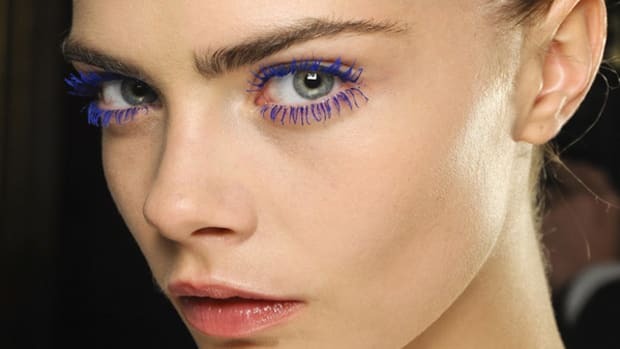 Brow-dazzling, blue mascara and more. The best haute couture beauty looks might've happened in the front row. A-list ladies with A+ beauty! Check out Jennifer Lopez, Jessica Alba and my girl Emma Stone. Emma Stone is a redhead again, Leighton Meester goes Ombré and Hailee Steinfeld can do no wrong.